This post only slightly has to do with sewing... I am in the middle of making a dress for a wedding I am going to, but nothing is ready quite yet. I listen to a lot of podcasts while I am sewing, walking or stuck in my commute. When in traffic, they help me avoid road rage. When sewing or crafting, they keep me entertained without having to stare at a TV screen. I thought maybe some of you might enjoy the recommendations, too. Here my top eleven favorite podcasts. Some are new, some new to me and some old favorites. I don't get anything for plugging these, I just thought that I would pass them on because I love them and maybe you will love them, too. 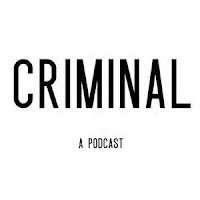 ..because it HAS to start with this podcast. For me, this is the one that started it all. I can't tell you how much I love this show. 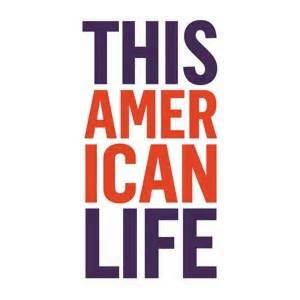 It is hosted by Ira Glass and features stories with a human spin. Each week has a theme. If you buy their app for a ridiculously cheap sum of money, you have access to every single show they have put out. It is years worth of quality shows for pennies an episode. I bought it and love it. 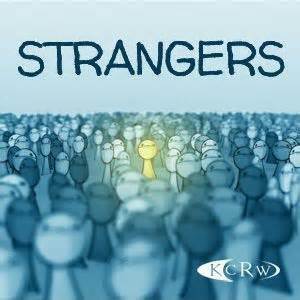 I just found this one and have only listened to a few episodes. Starlee Kine (of This American Life fame) hosts and solves a mystery that "can't be solved by just googling". You will think this is charming if you think Starlee Kine is charming, which I do. The shows are quirky and funny. 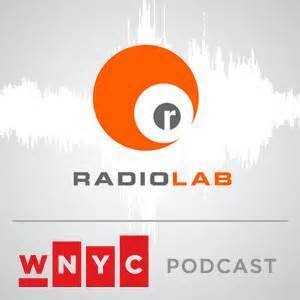 This is hosted by the silky-voiced Roman Mars and is about design and architecture. That subject has the potential to be really boring and textbookish, but it is anything but. They delve into the personal stories of the design, the designers and how things have ended up the way they are. One of my favorite episodes is the affection that people have developed for the carpet at the Portland airport. Another is the history of "la noyée de la Seine" death mask and how it became the CPR dummy face. This is highly entertaining. 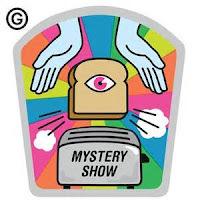 Other favorite episodes: La Mascotte, There is a Light That Never Goes Out, Guerrilla Public Service. 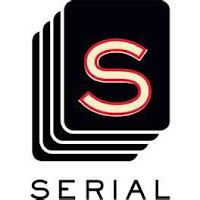 At its core, this is a show about science, scientific breakthroughs, oddities and complicated concepts broken down and explained in a very amusing way. 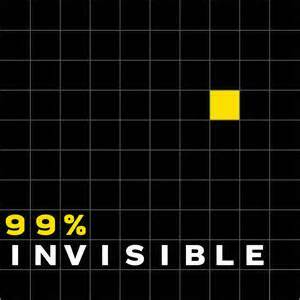 The two hosts have different theistic views and get into a couple of friendly debates about philosophy that are interesting. They are the kind of debates you wish people would have instead of just name-calling. But it isn't all debate. In fact, it is mostly about science. Some of my favorite episodes: American Football, Galapagos, Patient Zero. I just started listening to this one and can't believe I didn't find it sooner. 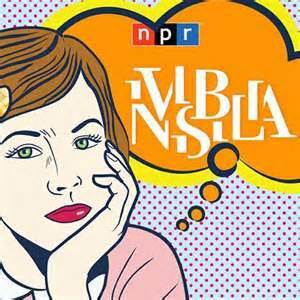 It is another story-telling podcast and it is done really well. I have only listened to a few episodes, but am excited to see there are lots of episodes in the feed available. Finding this podcast was kind of like reading an awesome book, only to find out it is first in a series of eight. I am looking forward to digging in. 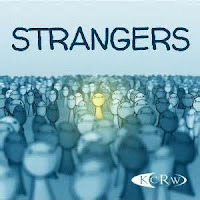 Hosted by Lea Thau, these are stories of how strangers become involved in each others lives. I listened to all the episodes in a weekend. Lea Thau really opens up in these stories and some are deeply personal, yet relatable. Her voice isn't like the voices you normally hear on the radio. It took me a little getting used to, but I did soon enough. 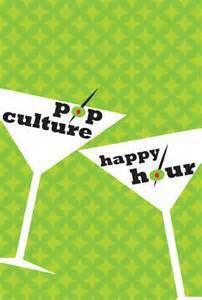 Favorite episodes: Adrian's Race, Kenna Fisher, Two Men and a Baby. This is the story of a murder, the accused murderer and the case itself. 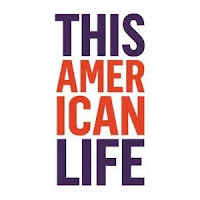 It is hosted by another This American Life alum, Sara Koenig. When it was running, I waited for the day it came out and listened right away. Listen to these in order. It is on hiatus for now but will come back. It's Neil DeGrasse Tyson's podcast. 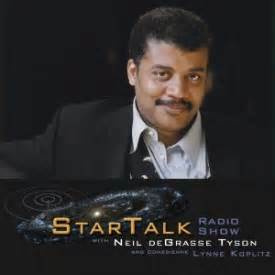 Smart people talking about science. The theme music is super annoying and surprisingly long, but when you get past it, the smart people are funny and this is entertaining. Plus, you will learn stuff to make you seem smarter than you are at dinner parties. I loved the episode featuring Elon Musk. This show would be what it would feel if like all my best friends and I were suddenly really witty and swore less. A lot less. This podcast took a couple of episodes to get to know the hosts, but it didn't take long to love them. I especially like the segment at the end of each episode "Whats making me happy". They are gifted at talking about shows, movies and books without giving away spoilers that would ruin them. It feels like a wine and cheese party with people cooler than I am, but somehow they invite me to the party, anyway. This started in December, then took a break in February. Allegedly, it will come back again soon. It is hosted by Lulu Miller (of RadioLab) and Alix Spiegel, (of This American Life) who have incredibly similar sounding voices. They are aware of it and make light of it. By the end, I think I could tell the difference between the two. Probably. 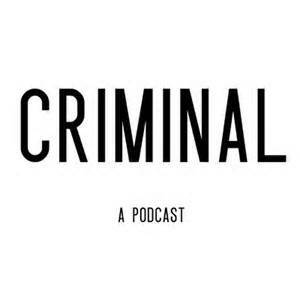 I can't wait for it to come back, but in the meantime, all of the previous episodes are available for listening. Enjoy! Do you have any podcasts that you would add to the list? Hi everyone! 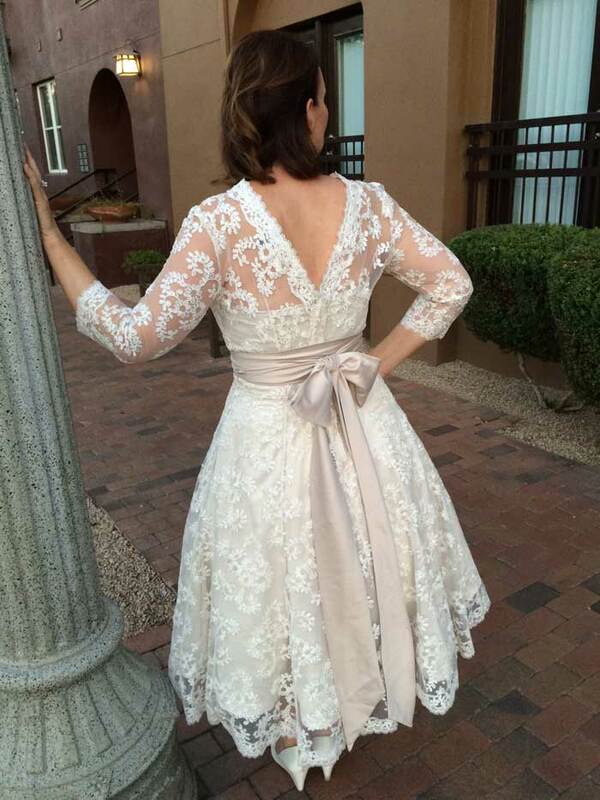 In my last post, I showed pictures of my finished wedding dress. This time around, I'm showing the construction process. The post is fairly picture-heavy - there were a lot of steps. 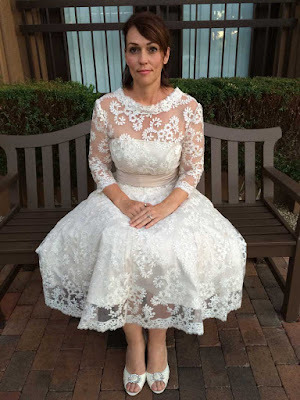 In case you missed the last post, here is the dress. 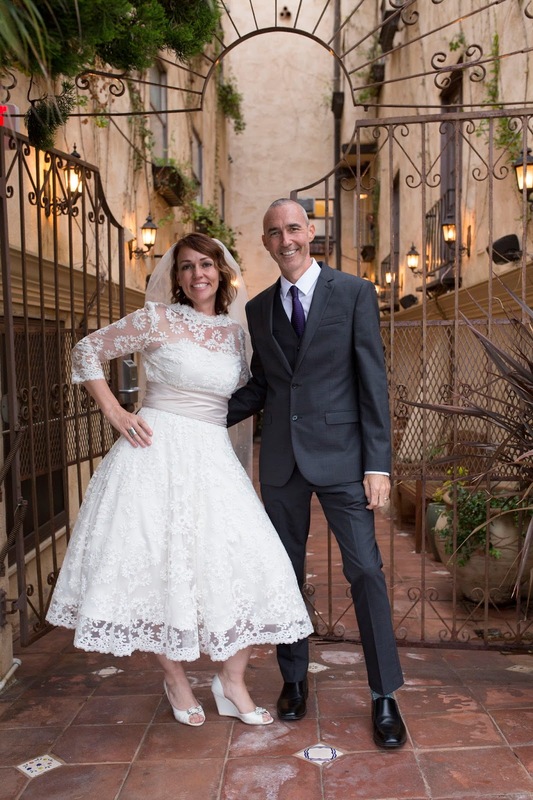 This is a picture right before we got married. 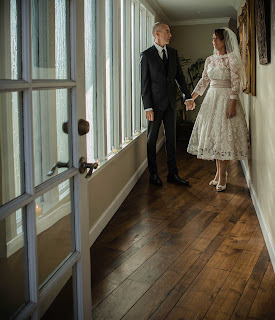 We waited in the hall and took a deep breath before going outside to the back yard where everyone was waiting. I didn't want to walk out all by myself with him waiting, so we went together. I was really nervous about wearing a dress that looked homemade. I think the worst compliment you can get about any homemade item you have is from (probably) well-meaning strangers - "That is nice - did you make that?". That one always makes me feel terrible. It is the one that says - "Yes, it is clear to me that you have made this yourself." Ugh. 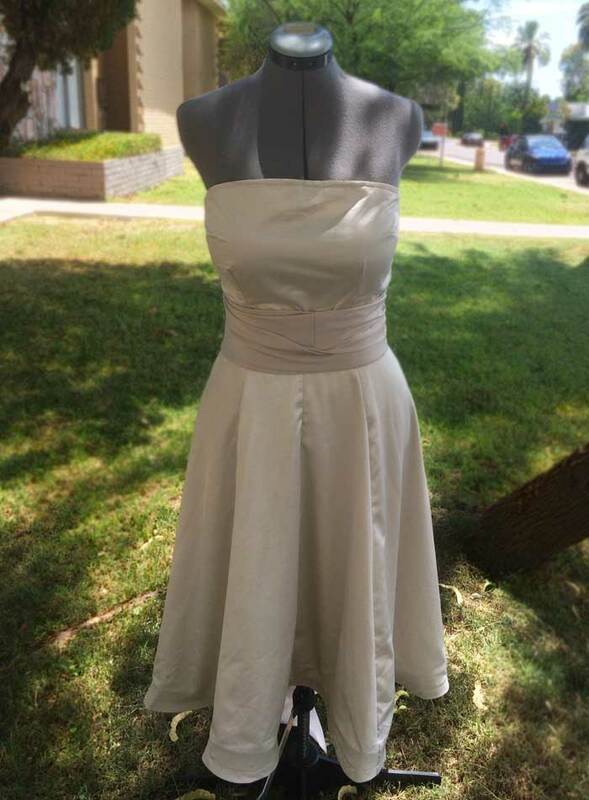 This dress is in three parts. 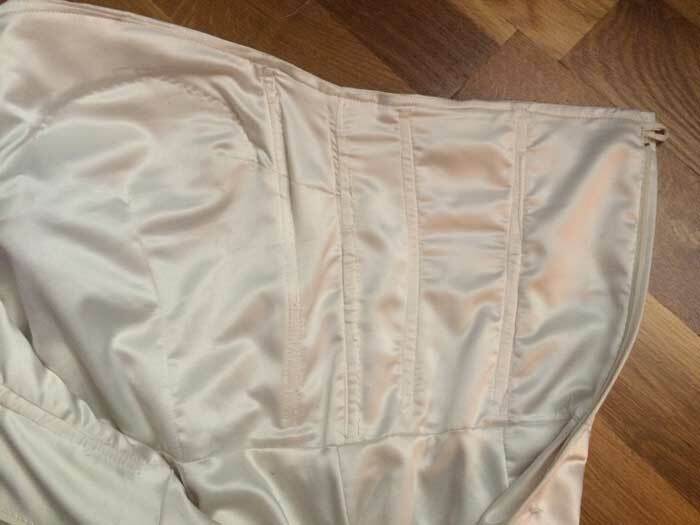 Part one - the petticoat. This is the largest petticoat ever. I felt so round and fluffy. It was an upcycled petticoat that I picked up at a thrift store. It was a floor-length with three tiers but the waist is a nice elastic and I'll bet it was expensive when it was new. All I did was take off the bottom two layers to make it tea length and re-sew the tulle. I used a serger for the bottom hem. It was a lot faster than making it all myself. Part Two - the satin under-dress. 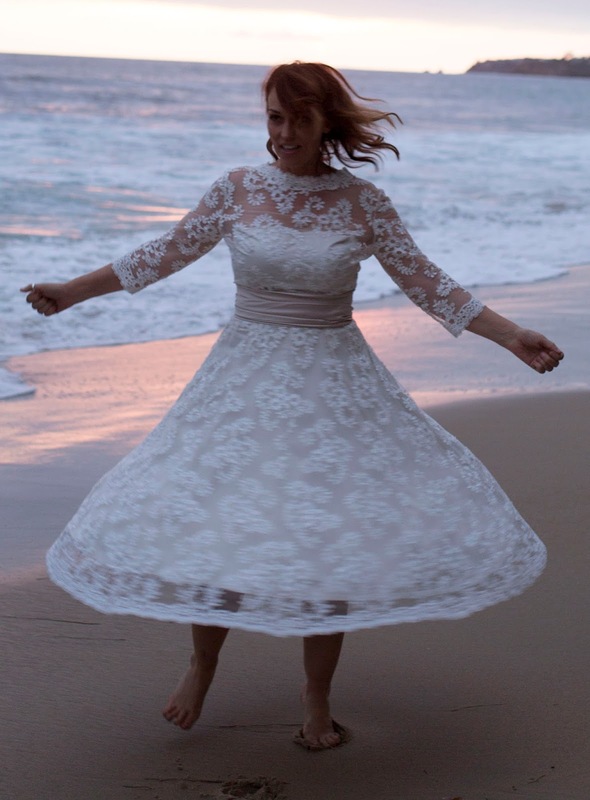 The pattern is Simplicity 1194. I made it in ivory with a am showing it here with a champagne sash. I made four changes to the pattern. I added an inch to the bodice and made it longer. My torso must be long because I find myself doing this to a lot of patterns. I took off the straps and made it strapless. I made it fully self-lined instead of using facings. I don't usually like using facings and seem to find ways to avoid them. I added boning and some light-weight interfacing layer to the inside. The dress has a lapped zipper (thanks to the Craftsy Mastering Zipper Techniques Class) and I added n silk covered button and loop. Part Three - the lace layer. 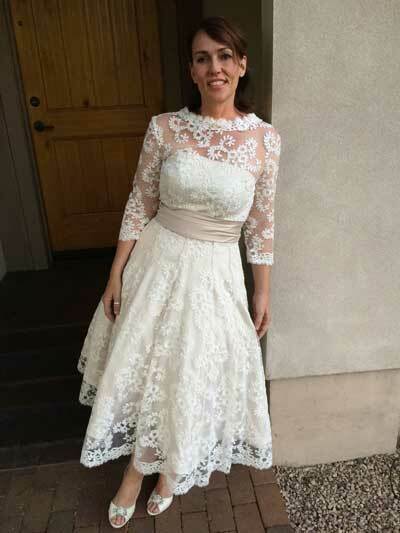 The lace layer is a mix of Vogue 8943 and Simplicity 8470. 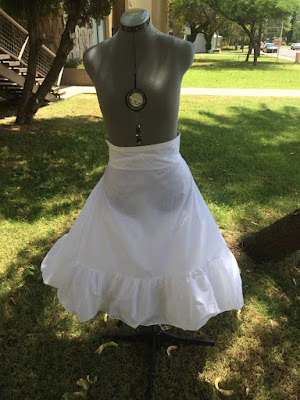 For the skirt, I wanted to avoid pleats and gathers and love the look of a circle skirt. 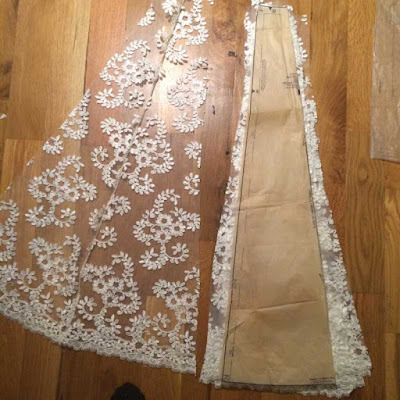 But to be able to use the edge on the lace, I had to cut the skirt in panels. 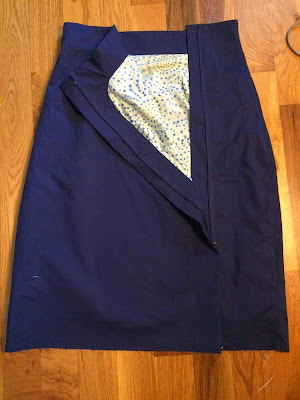 I did use the Simplicity 8470, but then added a couple of inches on either side toward the hem of each panel for a fuller skirt. It ended up being about a half circle skirt. 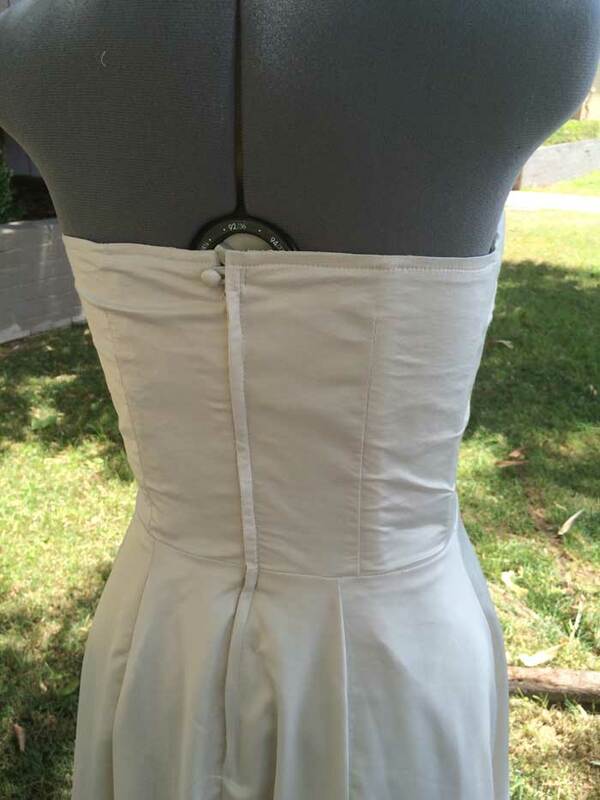 Luckily, through no special effort, the lines on the skirt panels lined up perfectly with the darts in the bodice. Below is the skirt before I sewed it on the bodice. All of the panels are sewn, then finished up with a serger. I made three changes to the bodice of Vogue 8943 - once is that I added an inch to it (shown in red below). In the past, I have been known to ignore the "lengthen or shorten here" directions and just adding more to the bottom of the piece. But on this, I even followed instructions. I also shortened the sleeves to 3/4 length and changed the back of the bodice to a V shape instead of ending at the neckline. The hardest part about the dress was figuring out what to do with the edges around the neck and the zipper. 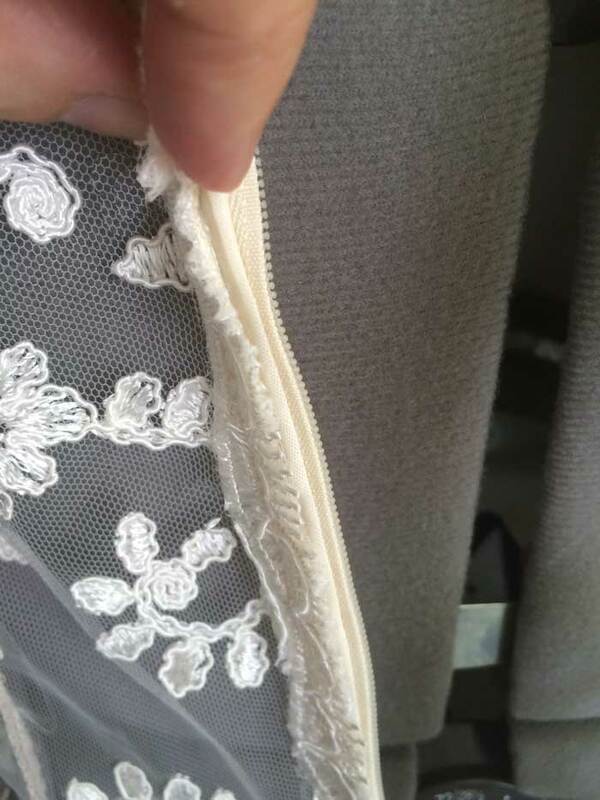 I had never sewn lace before, so I wasn't sure. The edges of the sleeves and the skirt hem were easy... use the edge of the lace. 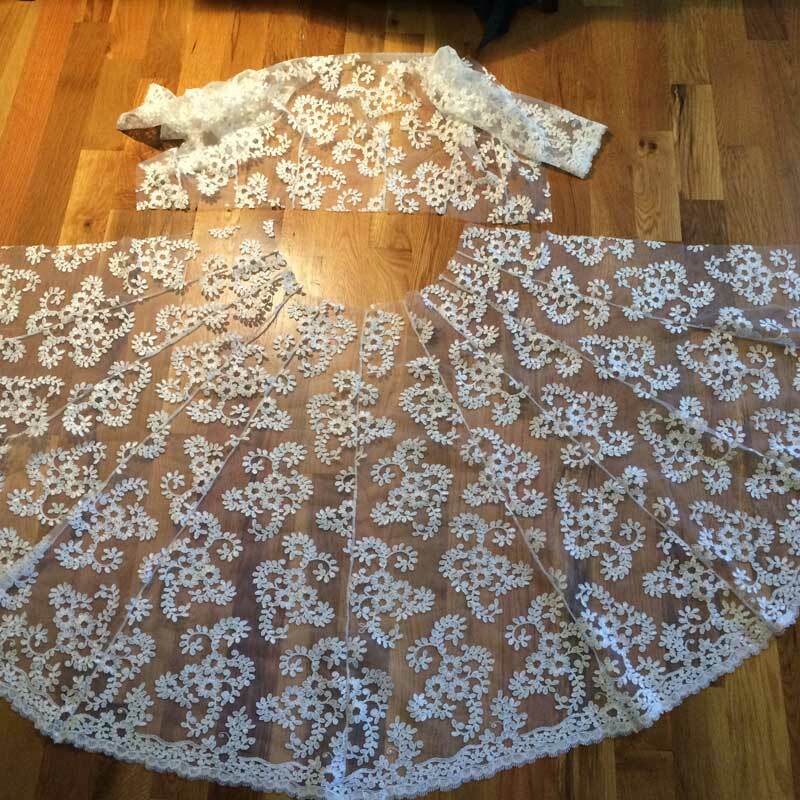 I ended up cutting the edge off of leftover lace and attached it all around the neckline - front and back right up until the zipper. You don't end up seeing the stitches of the ivory thread to sew it on - it all gets lost in the lace. The zipper is actually three layers. I first sewed on some bias tape to stabilize the lace so I could sew a zipper on the back. Then, on the outside, I covered the bias tape with the same edge of the lace as the neckline, but cut narrower. I am sure there are other ways to get it done, but I was at a loss. 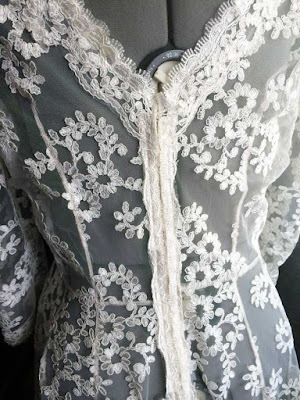 I spent a lot of time Googling and looking at lace wedding dress backs, but didn't find much. I even made a trip to a bridal shop to look at their dresses. In the end, this looked nice against the satin under-dress. $10.00 - Tulle for petticoat from JoAnns. $10.00 - Upcycled petticoat from a thrift store. 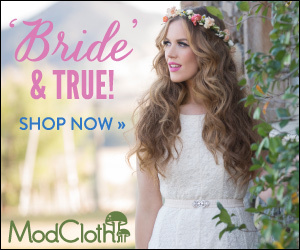 TOTAL $270.00 - Petticoat, veil, dress, sash and extra fabric for prototype dresses. It wasn't necessarily the cheapest option. 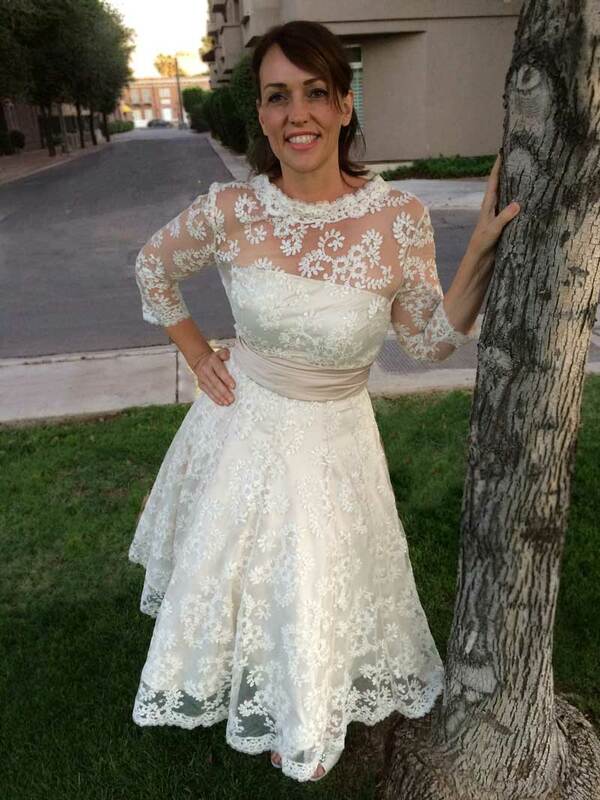 I am sure I could have found a dress on sale at some bridal shop for less money, but I am glad I made mine. Hello everyone! I finished my wedding dress. Oh, and I got married! 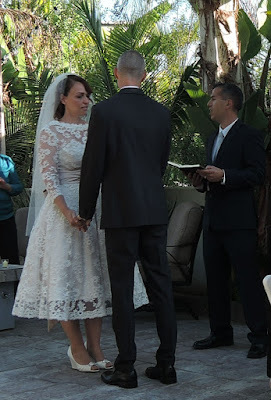 Here is what I found out about the wedding: Not one person I have talked to had a romantic wedding night. Without fail, everyone says that they end up giving each other a peck on the cheek before falling over from exhaustion. If you had a romantic wedding night, I bet that you ran away to elope or something. We cooked all of the food ourselves. 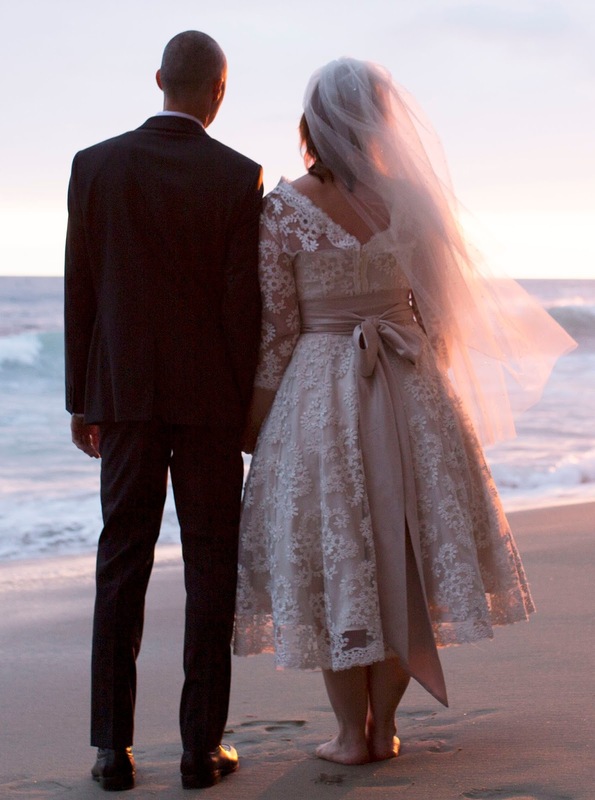 I enjoyed the fact that we had total control over ingredients and I liked setting up the backyard wedding ourselves, but I see the appeal of running off, eloping and having a really great vacation with the money you would have spent on the wedding. I see it clearly NOW, that is. 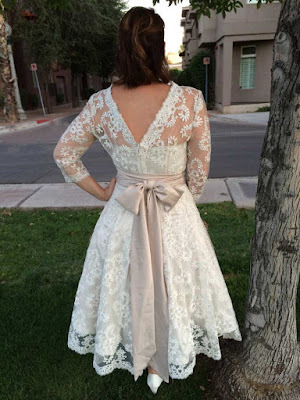 I'll post again soon to talk about making the pattern for the dress, but I wanted to show photos of the finished dress. I was really nervous about it, but I am happy with the end result. What about anyone else? High stress or stress-free wedding? Did you sew your own dress? Would you do anything differently? More on the construction on the next post. Talk to you soon! I am currently sewing the Tilly and the Buttons Arielle skirt. I couldn't resist ordering it because it is so cute in all the photos. And Tilly is adorable. Look at it. Swoon. I just love how this skirt looks. On these people. I am struggling a little with the fit for my body type. The pattern allows for a hip that is 9 inches larger than the waist. Uh-oh. I am something more like 13 inches larger at the hip than the waist. And 13 feels so nice, I usually do about 14 just for good measure. There is a significant amount of junk in that trunk to deal with. 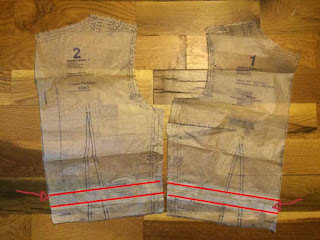 I redrew the pattern to combine sizes to get the correct hip and waist measurements without an issue. The problem is that the skirt falls straight down from the widest point on the hip. When I choose the longer length, it ends up looking very, very matronly due to the wide fabric at the knees. Noooooooo! Where is my cute skirt? It is so frumpy. It hasn't been hemmed yet, but this work in progress picture does give an idea of the shape. I also put in a zipper, but only really because my buttonhole function on my machine is currently acting up. I'll put at least fake buttons on it because I think it is part of what drew me to this skirt. To be clear, I think this is a great pattern and there are great instructions. I would recommend it. But for my body type and there need to be some adjustments to make the skirt less bulky because I made sizing changes. 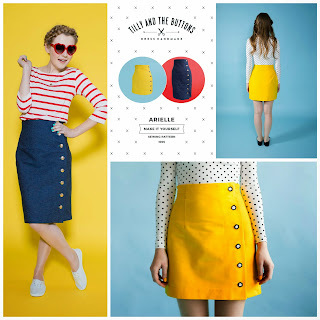 Specifically, I think I can bring the skirt in a bit like in the wiggle dress from Gertie's New Book for Better Sewing. 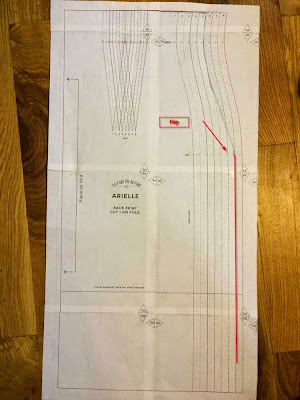 Here is the pattern piece for the wiggle dress. After the fullest width at the hip, it tapers in. I may not make Arielle as tapered, but it does give me adjustment ideas. Above, is the wiggle dress I made unretouched on the left, then I photoshopped a fuller skirt on the right. 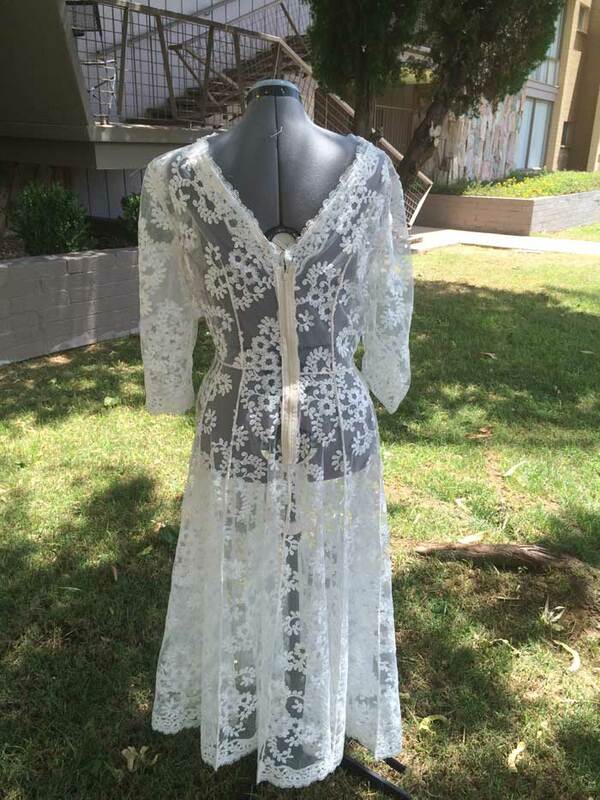 It is an ok look, but more matronly than I am looking for. 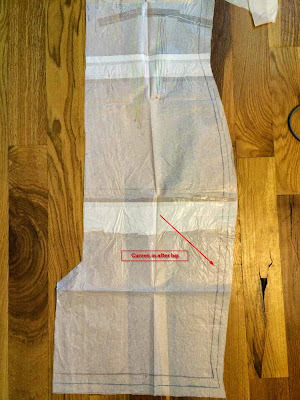 If I adjust the skirt pattern to taper in like the wiggle dress, I think I will get what I want. In other news, when I am not sewing, I read a lot. I have gotten some great recommendations from blogs I read, so I thought I'd pass one on. Right now I've started The Mortal Instruments book one City of Bones by Cassandra Clare. I am well aware that I am not likely their target demographic since this is young adult fiction, but it hasn't stopped me from enjoying the first half of the first book. I am excited that if I like it, there are 5 more books in the series to read. I only have one complaint about the book so far. The author has her characters biting, chewing or gnawing on their own lips a lot. So much so that it is distracting. "She bit her lip and answered him." "He chewed his lip and stood up." It must have happened about 30 times in the first half of the book. Get these people some chapstick. More on the Arielle skirt in the next post - so.. until next time!